ThirtyFifty hosts regular wine tasting events for you to attend in Leicester at the City Rooms in the heart of the city centre. Choose from our Introductory or Discovery Wine Tasting Evenings - no wine tasting experience required, the evenings are fun and educational for beginners and those with a little knowledge will learn something too. You can purchase an open dated gift voucher so that a date can be booked after your gift has been received. We'll automatically email you a link to the gift voucher to print off at home. If you prefer, we have printed gift vouchers that we can post to you or your gift recipient for £2 (select on check out). 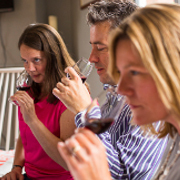 Our Leicester wine tasting evenings are both refreshing and fun, but also easy for budding wine enthusiasts to get a solid grounding that will help navigate the world of wine with confidence. The wines are matched with a selection of delicious hot and cold canapés. Find out more about our courses by clicking the name of the tasting. Not found what you are looking for? Register your interest in attending a wine tasting event in Leicester by completing the form below.